Greenwood, Indiana is in Johnson County, between State Road 37 and Interstate 65. The Delaware Indians originally made the area home, but in the early 1800s, American and European settlers began to make the area home. In 1864, it was incorporated as a town, and then as a fifth-class city in 1960. The city has an estimated population of 56,545. This historic town offers a variety of things to enjoy. The Oaken Barrel Brewing Company is a microbrewery and welcomes visitors. The Southside Art League has an art gallery on Broadway Street and displays work of local sculptors and arts. They also offer classes in various art forms. Outdoor lovers will appreciate the 14 city parks. The Surina Square Park offers the Greenwood Community Center and Amphitheater for special events, and they also have hiking trails. A wonderful place for parents and kids to explore is Children’s, Garden Park. It displays the artwork by area children, has an ornamental fountain and benches to sit and enjoy the park. The University Park, covering 40 acres, has picnic areas, basketball courts, and playgrounds. It also has a dog park separate from the other areas of the park. Water lovers will enjoy the Freedom Springs Aquatic Center, which boasts taller slides, with many twists and turns. It has a slow-moving river, group shelters, cabanas and an “island” for live performances. Besides the variety of activities to take part in, there are many dining and shopping opportunities for those times you are ready for a break in the activity. Real estate offerings in this growing city will give you options from older, less expensive homes, to new, contemporary styled single-family homes. You have choices from the ranch style, to split level, to brick and vinyl combinations to stone. There are older Victorian neighborhoods that have been restored, and upscale developments as well. 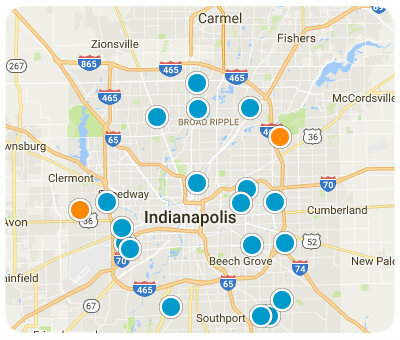 With its own diverse history, its good schools, low crime, and plenty of outdoor activities, this area combines its own amenities to that of nearby Indianapolis, and you have a must-see destination for home buyers searching in the Indianapolis area. If you would like more information on homes for sale in Greenwood, Indiana, please contact us today and allow us to assist you. Listing courtesy of Tim Tran. Listing courtesy of Norton Premier Real Estate. Listing courtesy of Bruce Richardson Realty, Llc. Listing courtesy of Dawson And Michael Realty, Inc.